Tom Perry avoids being skewered at a festival in the Solomon Islands that celebrates sorting out problems the old-fashioned way. Duels. There’s something wonderfully straightforward and final about them. Whether it’s cowboys drawing pistols at high noon, or kids straightening out an argument with a simple game of rock paper scissors, a duel is a no-nonsense way to settle a score between two warring parties. Yet duels have become something of a lost art. When disputes occur in our lives these days, they are far more likely to end up in a courtroom, or at the very least, with an exchange of strong words. But do these methods really do anything to address the anger and malice involved? Probably not. However, on Santa Catalina – a tiny island in the far east of the Solomon Islands – the idea of the duel and dealing with grievances is alive and well. Out here in the Pacific it is the old-fashioned spear that’s used for resolving disagreements. Preparing for the afternoon fight. While I’d heard small tidbits of information about the customs on Santa Catalina, neither I, nor any of the 10 or so other visitors who arrived by dingy in this remote part of the Solomons, knew the extent of what we were getting ourselves into. We all knew spear fighting was supposed to be a big spectacle, and we knew it was an important part of the island’s culture, but little else. 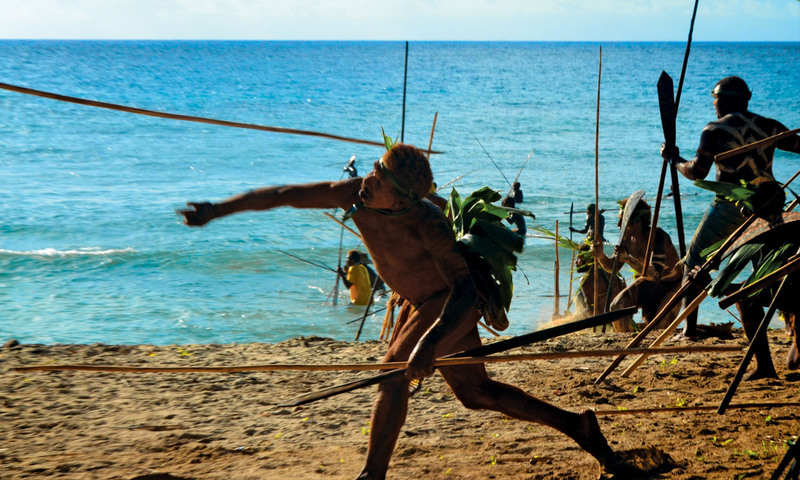 At the Spear Fighting Festival (known locally as Wogasia) the men of the island’s two tribes, the Amuea and the Ataua, meet on the beach at dawn and at dusk to lob sharpened sticks at each other. This is to sort out their disagreements from throughout the year – such as an unreturned household item, a broken marriage or a land dispute. While spear fighting is obviously central to this event, the Wogasia goes well beyond the fight and the need to resolve differences. It is a three-day festival of complex rituals aimed at purging the community of the problems and frustrations of the previous year and, in doing so, set up the island for a solid root crop harvest. The festival formally starts with the ceremonial washing of a conch shell (selected from hundreds of shells by Santa Catalina chiefs), before the islanders meet at midnight to begin an all-night procession of chanting and conch shell blowing. Wogasia is a three-day festival of complex rituals aimed at purging the community of the problems and frustrations of the previous year and, in doing so, set up the island for a solid root crop harvest. One of the best things about the Wogasia is that the few visitors there for the festival are well and truly involved in the action. I spend much of the event side-by-side with my host, Edward Wasuka, immersed in the festival’s traditions. I am taught everything from throwing and blocking a spear, to chewing betel nut and blowing a conch. I even learn the best designs to smear on my body as I cake myself in mud. At 2am on the night before the spear fight, the Santa Catalina women lead a frantic sprint through the villages, beating the ground with fire-lit coconut palms to drive disease and demons from the island. 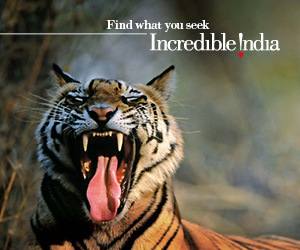 It’s wild, uninhibited stuff. The fronds crack loudly as they are smacked into the ground, sparks fly, children scream and elderly women stand in their doorways throwing buckets of dirty water and fish guts at those running past. Later in the night as Edward and I are sitting down for a pre-festival coconut and some betel nut, I ask him what he is expecting from this year’s event. “I’m just looking forward to fighting,” he says, with a wry smile, clearly indicating that there are some issues he is looking forward to resolving. After days of build-up and a sleepless night of chanting, conch blowing and much talking, I can appreciate Edward’s keenness to get out on the beach and start throwing some spears. As the sun rises on the festival’s big day, two of the Aumea tribe’s toughest warriors, painted in mud and wrapped in branches, commence proceedings by heading to one end of the beach. They dance in the shallows, bang their spears and wooden shields together, and scream the names of their enemies down the beach. Two warriors from the other tribe then emerge to lead the opposing charge, as more and more join the line-up on each side. Both groups move closer towards each other, howling, kicking water and stamping spears into the ground, before a lone fighter – the ‘chief of warriors’ – runs through the shallow water to the front, signals out his enemy and goads him from just metres away. The first spear is thrown (it is deflected with a swift move of a shield), the island’s chiefs nod the all-clear. From that moment, it’s on. Up to this point, I’d enjoyed the bravado of the whole event, with constant talk of the spear fight, the kids threatening the visiting ‘whiteman’ with half-hearted jokes. But as a roar sounds down the beach and the two tribes begin their fighting, with spears flying in all directions, any sense of playfulness I’ve had about the event evaporates. A stray spear lands with a thud in the sand just centimetres from my feet, and I stumble back into a group of elders standing behind me. It occurs to me that despite my few hours of learning how to throw and block a spear, I am way, way out of my depth and I’d best stand back. The sound of spears hitting shields fills the length of the beach. It’s a surreal event to witness so closely. Some spears travel frighteningly fast at their targets, hitting legs and grazing arms, others wobble through the air and fall far short. Supporters stand behind the fighters, collecting stray spears and passing them back to combatants. Families yell their support, while a group of island elders adjudicate proceedings from the safety of the dunes. I watch Edward charge his way into the fight. As he takes on two men at the opposite side of the battle, I wonder what it was that he did during the year to warrant a two-on-one fight. After less than five minutes, it’s all over. The elders run down the beach calling an end to the fight. Spears are laid down and, within seconds, hands are shaken, smiles return to faces. It’s like a spear was never thrown. Friends and families from both tribes converge on the beach, and I see Edward and his two foes smiling and slapping each other on the back. Fighters who minutes earlier were launching spears at each other walk ceremonially together under a rokbonaparagu vine, signifying their unity and the end of their grievance, before everyone heads home to laugh and swap stories from the battle. Having stood a little too close to the fight, I can attest that this is no theatre spectacle. These are actual spears thrown with real power at real people. There is genuine danger involved in the whole event. I saw at least five direct spear hits to legs or hips, two that resulted in fighters having to be carried away mid-fight. And the people of Santa Catalina still talk of the infamous 1974 fight, where one unlucky warrior lost an eye after a spear went into his eye socket. Resolving problems the old-fashioned way. With that said, island elder Chief Gordon Raroinamae emphasises that there have never been any deaths from the event – at least not in living memory. “The purpose isn’t to kill or harm your opponent; it is a test of his courage,” he says when we sit down for a long chat afterwards. He tells me that Kastom beliefs also play an important role in keeping the fight fair. Should a fight get out of hand, or a spear be thrown with bad intent, then there are three or four senior women on Santa Catalina who have the power of a secret chant that can redirect a spear from its target, or even shatter it mid-air. On the afternoon before the final spear fight, the women head to Faraina, the island’s highest point, to cut banana leaves and chant cheeky insults at the men. All the men join the women on top of the hill, where we cover ourselves in aranpagora, the island’s sacred orange mud, before wrapping ourselves in ferns and marching back down. We ceremonially yell out to the women below at each break in the trees, before storming through the village, stamping our spears on the ground and separating into respective sides for the next spear fight. As the first spear is thrown, I’m proudly still there, ready to get among it. But despite my enthusiasm, Chief Gordon pushes me away from the pack with a friendly smile and tells me, “Maybe you should just watch.” I half-smile and thank him for saving me the embarrassment of a certain stray-spear injury. Women dressed as qarates (bush women) throw stones at the men to mark the end of the three-day festival. The women are covered in mud and dressed head to toe in banana leaves, resembling an army of walking trees. They line up and throw stones at the men, before sprinting into the ocean, where they stand proudly half-naked in the shallows as the sun goes down on the festival’s final afternoon. 1. Fight only with someone who has made you angry or caused you distress. 2. If you are fighting a member of your family, you can only fight a brother or a cousin – never your father or an uncle. 3. If an issue has been ‘formally’ reconciled (through compensation payments), but the grievance is still in your heart, then you are encouraged to fight to resolve it. 4. If your spear hits the wrong person, expect to pay them compensation after the fight. Solomon Airlines flies from Brisbane to Honiara. From Honiara, fly to KiraKira (the capital of Makira Province, on San Christobel island), then boat it over from there. The boat trip would take three or four hours at least, weather dependent. The Spear Fighting Festival, or Wogasia, takes place on the island of Santa Catalina, Makira Province, in late May/early June every year. To find out more, contact the Solomon Islands Visitors Bureau.